Phil Chadwick's Art: #2119 "Chippewa Falls Cascade"
This was my first day on the eastern shores of Lake Superior after leaving my friends of the Southampton Art School's Wind Waves and Weather 2018. I wanted to thoughtfully retrace the steps of some artists and paddlers that I admire. I was parked where the Chippewa River goes under Highway 17. There were several historical plaques at the car park and I read them all. This location was about half way along the Trans-Canada Highway between St John's Newfoundland and Victoria on Vancouver Island. There was also a display of the Great Artists in the Land of Waterfalls and one that told all about Chippewa Falls. These plaques made for interesting reading while it rained. Apparently JEH MacDonald painted at Chippewa Falls in 1919 while on one of the Group of Seven Box Car Painting Trips. Montreal River was just to the north but the raging falls that MacDonald painted had been tamed for it hydro energy long ago. A.Y. Jackson actually painted at Chippewa Falls in 1955. Jackson's sketch "Streambed, Lake Superior Country" is now at the National Gallery of Canada. Alberto was still raining outside but not torrential so I decided to try to paint. The rain occasionally tapered off to more of a drizzle and I thought I could paint the white water rapid of Chippewa Falls up from the road in the periods between the heavier rain. The very smooth panel got very wet and the oils were slipping and sliding around. The bugs were not bad. The roar of the water from the heavy rain overnight was something to listen to and enjoy. 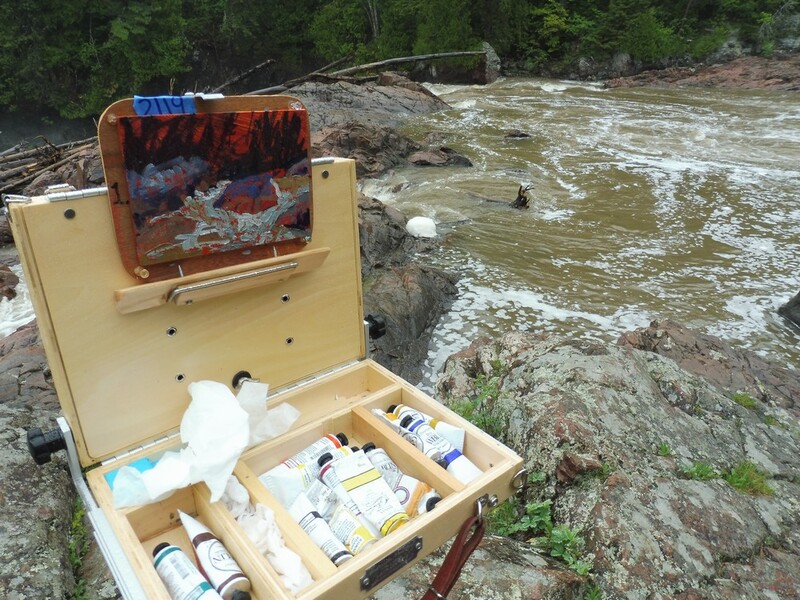 The resulting painting was mix of waterfall and tropical moisture and a few black flies. I packed out some garbage which was mainly comprised of tangled fishing gear and coffee cups. I would revisit the Chippewa in number 2197 "Chippewa Falls Batchawana Bay". For this and much more art, please click on Pixels. Thank you!